This board is a huge wall mural. It was displayed during an integrated Garden unit. I used white bulletin board paper on top and brown on the bottom. I sponged blue on top for the sky and stuffed white 3-D paper clouds. 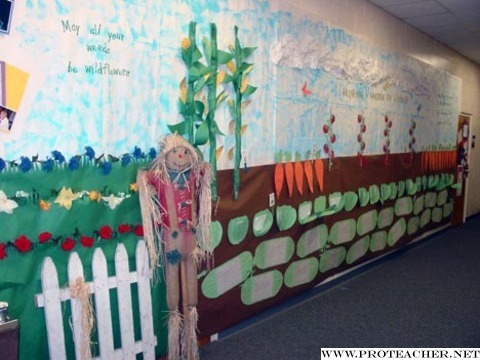 I also wrote painted two cute "garden" sayings on either end of the display.It shows student work as follows, with a seed packet title beside each set of vegetables. Carrots: Students wrote the beginning, middle, and end of their SSR books. Lettuce Write Paragraphs: Student wrote paragraphs and displayed them inside heads of lettuce. Ears to a Good Book: Book reviews were written on ears of corn. Watermelon similes: Similes were written after reading the book As Quick As A Cricket. Tomato Connections: Text-Self, Text-Text, and Text-World connections were written on tomatoes to the book The Suprise Garden.